The world's most popular handgun round has its detractors. Here's why they're wrong and everyone else is right. While the 9mm Parabellum--a.k.a. 9mm Luger, 9x19, 9mm NATO--is used by more armies, police forces and civilian shooters around the world than any handgun cartridge in history, it generates strong opinions among shooters. Some go so far as to claim its present popularity (it has, by the way, lasted 104 years) is but a passing fancy and shooters will come to their senses any day now and embrace larger caliber pistol cartridges. Its rich history begins with Georg Luger, an Austrian engineer employed by Ludwig Loewe & Co. of Berlin--later known as Deutsche Waffen und Munitionfabriken or DWM--who was responsible for radically redesigning Hugo Borchardt's cumbersome semiauto pistol into what became the Pistole Parabellum. A new cartridge was also developed for it, the 7.65mm Parabellum, a rimless, bottlenecked case 23mm long that was topped with a 93-grain full-metal-jacketed bullet that was propelled to 1,220 fps. Since the days of the first Browning Hi Powers, part of the 9mm's allure for armies around the world--including ours--has been the ability of pistols so chambered to hold lots of rounds. The pistol was adopted by Switzerland in 1900, and while the German army expressed interest, officials were concerned about the possible poor stopping power of the 7.65mm round. In 1902, DWM's engineers blew out neck of the cartridge case, shortened the length to 19mm, loaded it with a 9mm 124-grain FMJ, truncated-cone bullet traveling at approximately 1,150 fps and named it the 9mm Parabellum. Shortly after that, 9mm versions of the Pistole Parabellum were adopted by the German army and navy. After the Great War, several new 9mm Parabellum pistols were developed, the most prominent being the FN Mle. 1935 (Belgium), Lathi L-35 (Finland), Radom VIS vz. 35 (Poland) and the Walther P38 (Germany). Of these and others, it was the FN Mle. 1935--better known as the Browning Hi Power--that probably had the biggest influence on the popularity of the 9mm cartridge. The Hi Power introduced the high-capacity magazine, and the gun eventually became the most widely used military/police pistol outside of the Soviet bloc. 1955 saw the introduction of the first U.S.-made 9mm Parabellum pistol, the S&W Model 39, and beginning in the 1970s a plethora of new 9mm pistols were introduced that combined the DA/SA trigger mechanism of the Smith & Wesson with the Hi Power's high-capacity magazine to produce a genre of handguns that became known as the "Wondernines." While many traditionalists scoffed at the very concept of the Wondernine, the breed was immediately popular and soon became the choice of police agencies and armies around the world. NATO settled on the 9mm Parabellum as its issue pistol cartridge, and even the U.S. Army finally replaced .45 ACP 1911A1 pistol with the 9mm M9 Beretta. Then, in the late 1980s, Glock brought out the Glock 17, a high-capacity 9mm pistol with a polymer frame, and today nearly every major handgun maker has something similar in its stable. But yet, despite this widespread popularity, the 9mm cartridge has its fair share of detractors. Critics generally call out the round for two things: lack of stopping power and lack of accuracy. The author's ballistic gelatin tests with 9mm bullets such as Remington's Golden Sabre demonstrate the round's excellent mushrooming and weight retention. Perhaps at one time the "bigger bullets are better bullets" advocates had a point, but only to a degree. Ever since the less-than-positive interaction with the Moros of the Philippine islands, an influential clique in the U.S. Army has insisted that it was folly to go in harm's way armed with any handgun whose caliber did not start with a "4," and it is generally held that, when restricted to FMJ bullets, larger pistol cartridges are more effective than smaller ones. While partisans of the .45 ACP claim it has a proven track record as a close-range fight stopper, the 7.62mm and 9mm cartridges used by other armies have their advantages, namely better penetration and superior long-range performance. While we have all heard it claimed that the .45 will knock 'em flat even it hits 'em in their little finger, a number of studies have shown that, when using full-metal-jacket bullets, the performance of the .45 ACP and 9mm Parabellum are quite similar. According to the now-famous Strasbourg Tests, the Average Incapacitation Time of animals shot with .45 ACP hardball was 13.84 seconds while that of 9mm FMJ was 14.40 seconds. Further, Marshall and Sanow's study of one-shot stops in actual police shootings gives 9mm FMJ a higher rating (70 percent) than .45 ACP hardball (62 percent). For all practical purposes, the accusation that the 9mm Parabellum lacks stopping power has been rendered largely moot by the development of high-performance ammunition. Beginning in the early 1970s, American ammunition makers developed jacketed hollowpoint bullets for the 9mm Parabellum, many of which are now offered in +P and +P+ loadings. These have been constantly improved to the point where they now provide both reliable penetration and expansion. According to the aforementioned tests, results from 9mm JHP and .45 JHP are surprisingly similar. The Strasbourg tests of the best 9mm load (Federal 115-grain +P+) gave an Average Incapacitation Time of 8.9 seconds while the highest rated .45 ACP (Remington 185-grain +P) came in at 7.98. 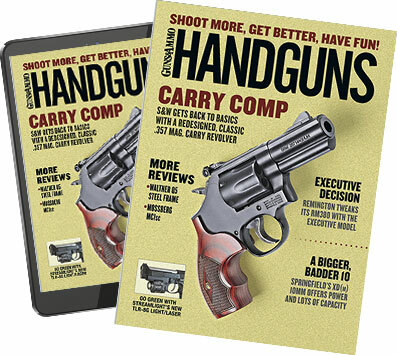 Marshall and Sanow rate the best 9mm load, also the Federal, with 91 percent of one-shot stops; the highest-scoring .45 ACP (Federal 230-grain HydraShok) had 96 percent. the ineffective pipsqueak many of its detractors claim it to be. The 9mm also gets knocked for a lack of accuracy. Until the 1960s, most American shooters' only exposure to the 9mm Parabellum usually consisted of shooting beat-up European military pistols with horrible sights and bad triggers. At the time, the only 9mm ammunition readily available in this country was the standard commercial FMJ load or surplus ammunition. But with the rise of the Wondernines came an increased use of 9mm pistols in bullseye, PPC, USPSA, IDPA and steel matches, which resulted in the development of high-performance match ammunition. Several years ago I tested an S&W 952 target pistol which, when fired from a rest at 25 yards with Cor-Bon 147-grain Performance Match ammunition, routinely produced one-inch groups. I currently use a Para-Ordnance 18.9 High Capacity Single Action pistol for steel plate matches which, with my 9mm handloads, has shown itself capable of shooting sub-two-inch groups at 25 yards all day long. The 9mm Parabellum is simply not the inaccurate wimp of a cartridge its detractors make it out to be, and I think there's another case to be made: that the 9mm is actually a more practical choice than its bigger-bore brethren. For starters, the 9mm is lighter. I don't know about you, but as I have matured I have developed an aversion to carrying heavy objects for extended periods of time and, accordingly, the two pistols I use for everyday carry are polymer-frame guns whose lightweight bona fides are accentuated by being chambered for the 9mm. As an example, my 9mm Glock 17 loaded with 17 rounds of 115-grain JHP weighs approximately 31.5 ounces, which is less than an empty .45 caliber 1911 pistol. Not only can 9mm pistols be made smaller and lighter than larger caliber ones, but the ammunition weighs less, which allows the shooters, soldiers and police officers to carry more rounds for the same weight. For instance, 100 rounds of 115-grain 9mm ammo weighs approximately 42 ounces, whereas an equal number of 180-grain .40 S&W and 230-grain .45 ACP weigh 59 and 74 ounces respectively. Now, while there are a number of excellent compact and subcompact .40 and .45 pistols, some of which are nearly as light as their 9mm brethren, the laws of physics dictate that no matter what you do about it, they are going to produce heavier levels of recoil. Recoil is one of the primary limitations to fast, accurate shooting. While some people are willing to exchange bullet diameter for speed and accuracy, I am not. I would much rather hit the target accurately and quickly with multiple 9mm projectiles than perhaps miss with one .40 or .45. Speaking of multiple projectiles, magazine capacity was, and is, one of the major selling points of 9mm pistols. While some say that high capacity leads to a dependence on "spray and pray" instead of firing well-aimed shots, I believe you can never have too much ammunition in a defensive firearm. And when I carry a pistol for personal protection, I think it's convenient having 12 to 17 rounds available without having to pack spare magazines. Many critics of the 9mm say the round must expand to .45 caliber to be effective while the .45 ACP, of course, starts out at that caliber. Assuming for a moment that .45 inch is the standard for effectiveness, my testing of three different brands of 9mm JHP ammunition shows that the cartridge passes this test with flying colors. I fired the rounds into ballistic gelatin blocks and then measured the size of the expanded projectiles and noted their retained weight. The Remington and Federal cartridges were fired into bare gelatin; Winchester rounds were fired into gelatin blocks that were covered with a layer of cloth to simulate a shirt. While this is only a modest sampling, it does show that different brands of 9mm JHP bullets, selected at random (only one of which was a +P loading), all provided more than adequate expansion and weight retention. My intent here is not to belittle the .40 S&W and .45 ACP cartridges nor to dissuade anyone from using pistols so chambered. My goal is simply to tell you this: With today's high-performance 9mm JHP ammo you get an accurate and sufficiently powerful defensive round--one fired from a handgun that is smaller, lighter, produces less recoil, has a higher magazine capacity and is easier to carry than its larger-caliber brethren. To my way of thinking, this is a win-win situation if there ever was one.